What type and size of tube did I use? What does it look like, and how much did it cost? The projectile travels down a tube inside the coils. It provides an air gap, which allows motion. Indeed, an air gap exists in all electromechanical machines. It is where magnetic forces are converted into motion. In my first coilgun I assumed that eddy currents would not affect performance, and used a conductive brass tubing. (To review, see Coilgun Tube Size.) I later discovered the eddy currents in brass was killing the performance. In this model, we'll use a non-conductive plastic firing tube. Hobby shops sell a variety of small building materials for radio-controlled cars, boats and trains. They offer tubing of many sizes and various materials. A well-stocked hobby shop (such as Abernathy's Hobbies in Bellevue, WA) includes a good selection of plastic tubing. This is thin-walled, rigid, inexpensive, and easily cut into convenient lengths. Perfect for coilguns! Plastic tubing comes in sizes which offer a loose sliding fit for the iron projectiles (a section of welding rod) used in my previous coilguns. I bought both 5/16- and 11/32-inch tubing. The metric size is 7.9mm and 8.7mm, respectively. 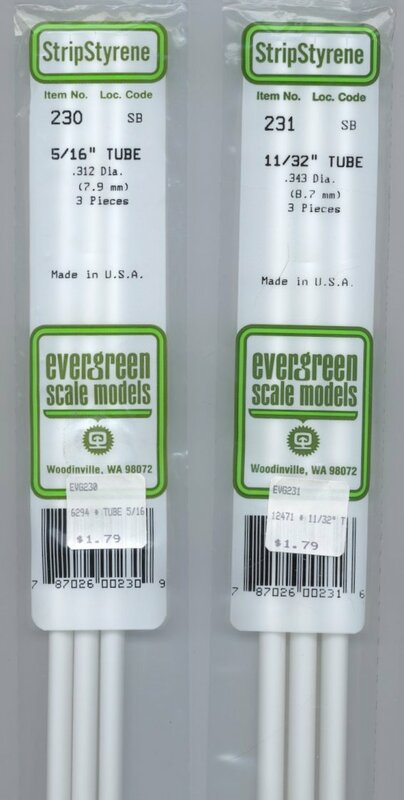 At $1.79 USD for a package of three 15-inch tubes, it is easy to get both sizes and experiment at home to find which works best. Click on the picture at right for a closeup of the package.